Cheering Democrats returned Nancy Pelosi to the House speaker's post Thursday as the 116th Congress took office and ushered in a historically diverse class of freshmen ready to confront President Donald Trump in a new era of divided government. Pelosi, elected speaker 220-192, took the gavel saying U.S. voters "demanded a new dawn" in the November election that swept the Democrats to a House majority and are looking to "the beauty of our Constitution" to provide checks and balances on power. She faced 15 dissenting votes from fellow Democrats. For a few hours, the promise of a new era was the order of the day. The new speaker invited scores of lawmakers' kids to join her on the dais as she was sworn in, calling the House to order "on behalf of all of America's children." Even Trump congratulated her during a rare appearance at the White House briefing room, saying her election by House colleagues was "a tremendous, tremendous achievement." The president has tangled often with Pelosi and is sure to do so again with Democrats controlling the House, but he said, "I think it'll be a little bit different than a lot of people are thinking." As night fell, the House quickly got to work on the partial government shutdown, which was winding up Day 13 with Trump demanding billions in Mexican border wall funding to bring it to an end. Democrats approved legislation to re-open the government — but without the $5.6 billion in wall money, which means it has no chance in the Republican Senate. The new Congress is like none other. There are more women than ever before, and a new generation of Muslims, Latinos, Native Americans and African-Americans is creating a House more aligned with the population of the United States. However, the Republican side in the House is still made up mostly of white men, and in the Senate Republicans bolstered their ranks in the majority. 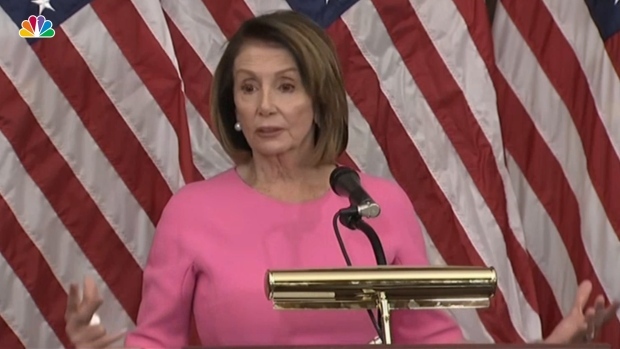 In a nod to the moment, Pelosi, the first female speaker who reclaimed the post she lost to the GOP in 2011, broadly pledged to make Congress work for all Americans — addressing kitchen table issues at a time of deep economic churn — even as her party readies to challenge Trump with investigations and subpoena powers that threaten the White House agenda. 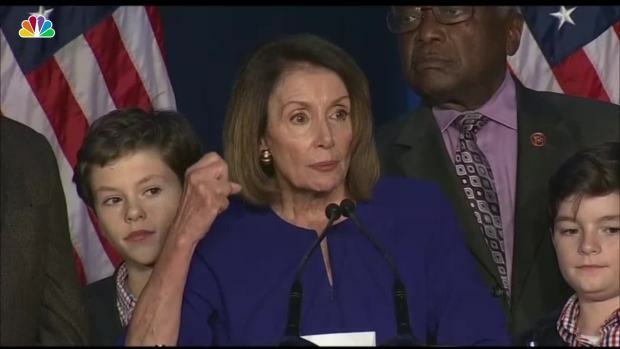 Pelosi promised to "restore integrity to government" and outlined an agenda "to lower health costs and prescription drug prices and protect people with pre-existing medical conditions; to increase paychecks by rebuilding America with green and modern infrastructure from sea to shining sea." The day unfolded as one of both celebration and impatience. Newly elected lawmakers arrived, often with friends and families in tow, to take the oath of office and pose for ceremonial photos. Then they swiftly turned to the shutdown. Vice President Mike Pence swore in newly elected senators, but Senate Republicans under Majority Leader Mitch McConnell had no plans to consider the House bills unless Trump agreed to sign them into law. That ensured the shutdown would continue, clouding the first days of the new session. McConnell said that Republicans have shown the Senate is "fertile soil for big, bipartisan accomplishments," but that the question is whether House Democrats will engage in "good governance or political performance art." It's a time of stark national political division that some analysts say is on par with the Civil War era. Battle lines are drawn not just between Democrats and Republicans but within the parties themselves, splintered by their left and right flanks. Pelosi defied history in returning to the speaker's office after eight years in the minority, overcoming internal opposition from Democrats demanding a new generation of leaders. She will be the first to regain the gavel since Sam Rayburn of Texas in 1955. Putting Pelosi's name forward for nomination, Rep. Hakeem Jeffries of New York, the incoming Democratic caucus chair, recounted her previous accomplishments — passing the Affordable Care Act, helping the country out of the Great Recession — as preludes to her next ones. He called her leadership "unparalleled in modern American history." One Democrat, Rep. Brenda Lawrence of Michigan, cast her vote for Pelosi "on the shoulders of women who marched 100 years ago" for women's suffrage. Newly elected Rep. Lucy McBath of Georgia, an anti-gun violence advocate, dedicated hers to her slain teenage son, Jordan Davis. As speaker, Pelosi will face challenges from the party's robust wing of liberal newcomers, including 29-year-old New Yorker Alexandria Ocasio-Cortez, who has risen to such prominence she is already known around the Capitol — and on her prolific social media accounts — by the nickname "AOC." California Rep. Brad Sherman introduced articles of impeachment against Trump, though for now the measures are largely symbolic. 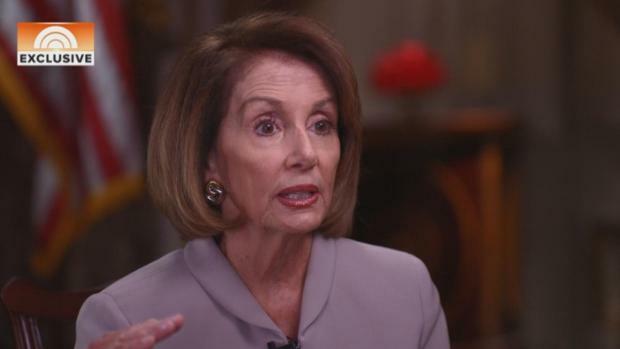 House Minority Leader Nancy Pelosi discussed unity between parties after the Democrats took control of the House on Election Day. Republicans face their own internal battles as they decide how closely to tie their political fortunes to Trump. House GOP leader Kevin McCarthy's name was put into nomination for speaker by his party's caucus chair, Rep. Liz Cheney of Wyoming, the daughter of the former vice president. He faced six "no" votes from his now-shrunken GOP minority. As McCarthy passed the gavel to Pelosi he said voters wonder if Congress is "still capable" of solving problems, and said this period of divided government is "no excuse for gridlock." One office remains disputed as the House refused to seat Republican Mark Harris of North Carolina amid an investigation by state election officials of irregularities in absentee ballots from the November election. Many GOP senators are up for re-election in 2020 in states where voters have mixed views of Trump's performance in the White House. Trump, whose own bid for 2020 already is underway, faces potential challenges from the ranks of Senate Democrats under Chuck Schumer. The halls of the Capitol were bustling with arrivals, children in the arms of many new lawmakers. Visitor galleries included crooner Tony Bennett and rock legend Mickey Hart, both guests of Pelosi. Incoming White House Chief of Staff Mick Mulvaney, a former congressman, sat with Republican leaders. Nancy Pelosi says she and President Donald Trump spoke via phone to talk about working together in the coming year with infrastructure being something they could agree upon. Rep. Emanuel Cleaver, D-Mo., opened the House prayer asking at "a time fraught with tribalism at home and turbulence abroad" that lawmakers "become the architects of a kindlier nation." Overnight, Democratic Rep-elect Ilhan Omar of Minnesota tweeted a picture with her family at the airport. The House rules were being changed to allow Omar, who is Muslim, to wear a head scarf on the chamber floor. She wrote, "23 years ago, from a refugee camp in Kenya, my father and I arrived at an airport in Washington DC. Today, we return to that same airport on the eve of my swearing in as the first Somali-American in Congress."